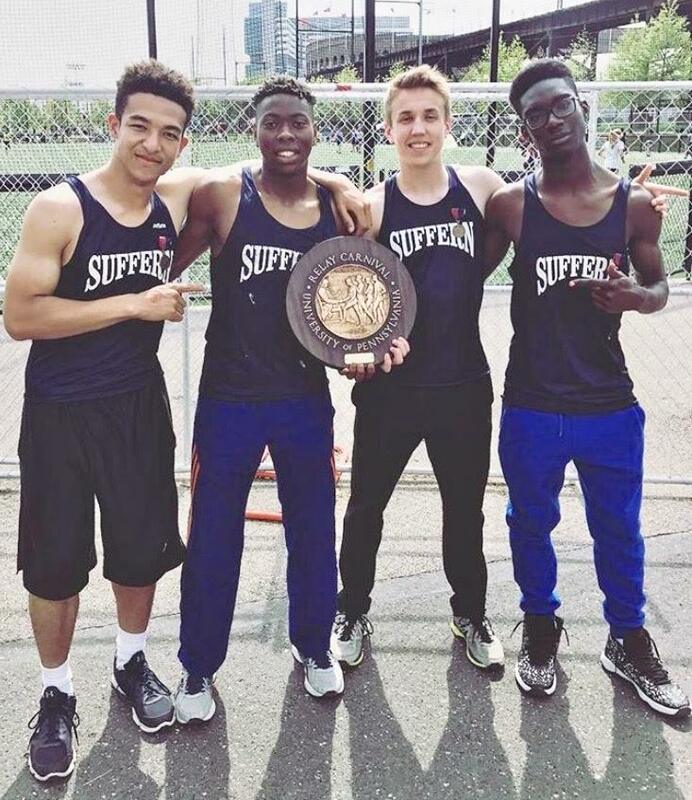 They only recently captured gold at the prestigious Penn Relays at Franklin Field in Philadelphia, and since last year, a talented quartet of Suffern High School track standouts have come this close to breaking the school standard in the 4×400 relay, not once, not twice, but three times. “We were hoping to do something at the county meet, but lost our shot because of a dropped stick,” noted long-time Coach Steve Duganzic of Pearl River, a three-sport athlete for the Pirates as a schoolboy (Class of 1970) and a three-sport competitor at Dominican College in Orangeburg. The Mounties are blessed with a pair of “very good quarter-milers,” said Duganzic, in college-bound athletes Myles Solan (Cornell) and Anthony Misko (Fordham University). Both went to the state meet last year. The quartet also features sophomore Daniel Hamilton and senior Garrison Williams, who is placed in an honors program at Rockland Community College. Solan, the county champ in the 400, is among the fastest in Section 1 in the 400 while Misko ranks among the top-10 all-time in the county. The vaunted 4×400 relay, also ranked at the top or near the top in Section 1, expects to receive stiff competition at the state qualifier from Nanuet, which features standout Brian Camillieri, who was ill for the county meet, and perhaps Pearl River. Suffern’s Solan was second at the state indoors meet, losing out by a thin margin after being bumped and losing on time to someone in another heat. Misko, indoors, had the best 600 statewide. At the fabled Penn Relays, Hamilton led off for the Mounties and increased the gap before passing the baton to Misko, who also picked up the pace, as did Williams. On the anchor leg Solan turned back all competitors to seal the deal. The Rockland County track and field championships in West Nyack staged a number of exciting events including the boys pentathlon in which Clarkstown South’s Sean Dolan edged Sean Le of Nanuet by a whisker in the final event, the 1,500, for a well-earned victory. Le was second overall with Shane Murphy of North Rockland in third. An upset developed in the boys long jump with Ramapo senior Rutchlor Louis leaping 23-feet to outdistance runner-up Dane Brown of Nyack, who measured 22-7. Brown was not to be undone, however, winning the 200 for his third consecutive outdoor crown and taking the 100 for a second straight year. University of Albany-bound Madjeanna Brutus of Spring Valley doubled in the girls high jump and long jump while Alex Harris of North Rockland was another double winner in the girls steeplechase and 800. Freshman standout Katelyn Tuohy of North Rockland set a meet mark in the girls 1,500 with 4:25.11, followed by Rachel Ludwikowski of Suffern. Tuohy also won the 3,000 for a third straight year, with teammate Haleigh Morales in the runner-up position, helping lead the Red Raiders to the girls championship with Suffern second and Spring Valley third. Pearl River won the boys team title, helped in part by double winner Matt Politis in the 1,600 and 3,200. Tappan Zee was second in the team standings, with Ramapo in third. North Rockland triumphed in the girls 200 with Ivana Lopez, followed by Brienna Alexander of Spring Valley; Joel Guichardo in the shot put; Rebecca Baez in the pole vault; and Nadia Saunders in the girls long jump. Spring Valley’s Chriseless Hendricks won the girls 100 and teammate Stephane Fortune won the boys 110 hurdles; Anneylse Benn of Suffern led the way in the girls 400, Lavenno Mitchell of Albertus Magnus was the boys high jump champ, and Tara Coyne of Tappan Zee led all discus throwers. North Rockland High School alumna Shannon Thomas, was aspires to become a physician, has made her mark in her first year at Rockland Community College, achieving success on the volleyball court and in the classroom. Thomas is one of only 77 recipients statewide of the 2016-17 SUNY Scholar-Athlete Award, which recognizes outstanding academic excellence and athletic success, announced SUNY Chancellor Nancy L. Zimpher. 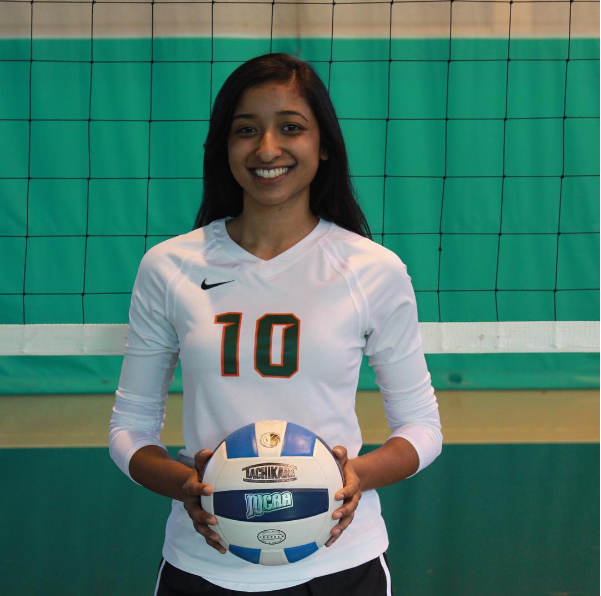 Thomas posted a 3.8 GPA while leading RCC’s volleyball team to the finals of the Mid-Hudson Conference and qualifying for the Region XV tournament. Thomas was named the conference’s Most Valuable Player in an all-region first-team selection, and ranked high in the nation in several statistical categories. She also earned academic all-region honors. Thomas will return to RCC in the fall, with plans to later transfer to a four-year college and ultimately attend medical school. “I hope to be a doctor one day, which has been a dream from a very young age,” she said. Top-seeded North Rockland ousted Scarsdale, 9-3, in the girls Class A semifinal in Thiells as Aleya Corretjer had three goals and three assists and Elizabeth Fox scored twice. The Red Raiders took a glittering 16-2 mark in the final against No. 2 Suffern (15-3), which was defeated in sudden-death overtime in an early-season showdown. Suffern advanced to the final following an 18-7 trouncing of Mamaroneck at Suffern Middle School. Alli Iodice sparked the Mounties (15-3) with eight goals and an assist while Abby Bosco added four goals. Kerry Sammon with parents Meg and Patrick. 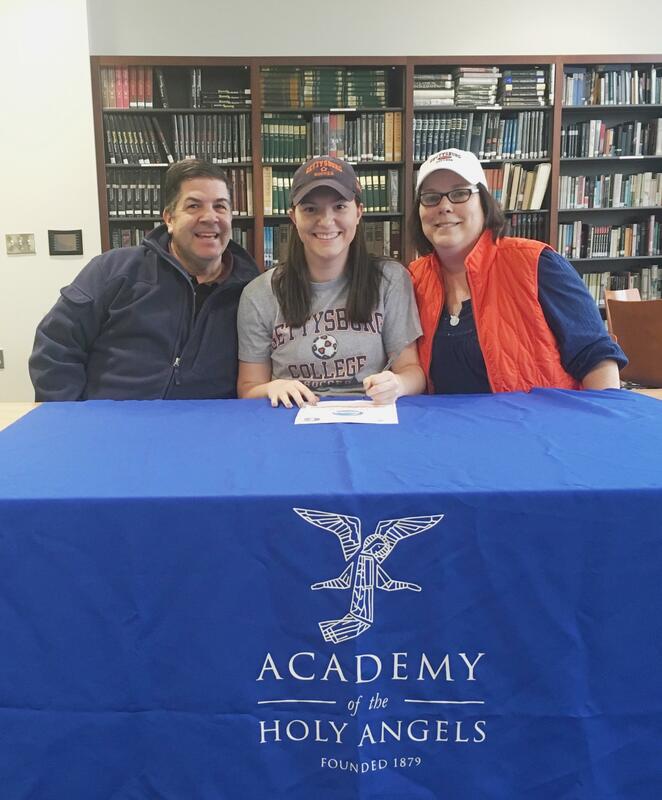 Kerry Sammon of Pearl River, a senior at the Academy of the Holy Angels in Demarest, N.J., has signed a letter of intent to play soccer at Gettysburg College. Sammon began playing soccer as a very young girl, and joined a competitive club when she was in the fifth grade. The University of Delaware women’s Varsity Eights, including Clarkstown South HS alumna Camryn McGrath of West Nyack, placed sixth at the rain-drenched Dad Vail Regatta on the Schuylkill River in Philadelphia. … Pitcher Vincent Lea, pitcher/third baseman Ivan Rodriguez, second baseman Pat Bateman and outfielder Jared Campione represent Rockland Community College on the all-Mid Hudson Conference baseball team. … Clarkstown South HS alum Anthony Morris, a senior right-hander, whiffed seven with one walk and allowed six hits in nine innings to lead the St. Thomas Aquinas College baseball team to a 13-2 victory over Southern New Hampshire in the NCAA Division II East Regional title game in Manchester, N.H. The Spartans meet UC San Diego on Sunday at 3 p.m. at AirHogs Stadium in Grand Prairie, Texas, to open the Division II Elite Eight championships. STAC outfielder Giovanni Dingcong was named the regional’s most outstanding player. Also named to the all-regional team were catcher Cris Ruiz, first baseman Bobby Morse, outfielder Mark Shkrelja, pitcher Chris Cepeda.